Shopping for a new Nissan Versa? The 2019 Nissan Versa Note SV Special Edition is a decent value overall, and it’s often discounted. The 2019 Nissan Versa sedan and hatchback deliver a new car smell and three-year warranty at rock-bottom prices. The old maxim, “You get what you pay for” applies otherwise. The $13,000 base Versa S is just that—basic, almost comically so. Dressing one up with options doesn’t mask the fact that Versas are simple, small cars light on safety tech and refinement. For not too much more, the Versa Note hatchback has more passenger and cargo space than the sedan, and it’s better looking. It’s the one we’d buy, but we’d also look long and hard at the used-car lot next to the Nissan dealer’s new-car showroom. Every Versa uses a 1.6-liter inline-4 rated at 109 horsepower. A 5-speed manual is standard on sedans, but a continuously variable transmission (CVT) is a far more common option. The Versa has a soft, reasonably well-controlled ride. Acceleration is leisurely at best around town and highway passing takes a wide-open road. The Versa’s tall body means it’s tossed around more in windy situations than most other new cars. Nicely weighted steering and an unladen curb weight of about 2,450 pounds mean it can be go-kart entertaining on a twisty road, but considerable body lean and narrow, fuel economy-oriented tires sap most of the fun. The Versa sips fuel around town, but its engine works hard enough to make it less thrifty than most size-up compacts on the highway. Sedans are rated at a miserly 34 mpg combined. Inside, the Versa is narrow and sparsely appointed. Its front seats are adequate and outward vision is good. Rear-seat passengers don’t have much leg room in sedans, but Versa Note hatchbacks have enough room for taller riders to be comfortable. Even with every option box ticked, the Versa lacks advanced safety tech such as automatic emergency braking, a feature we consider essential in 2019. The 2019 Nissan Versa is more big-box store than Ikea when it comes to cheap fashion. Someone should tell the 2019 Nissan Versa that inexpensive style doesn’t have to look its price tag. Fast-fashion retailers such as Zara and H&M get it, but Nissan doesn’t. 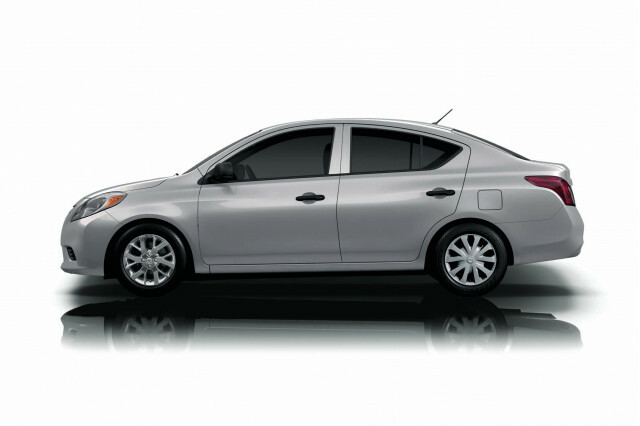 The narrow and tall Versa sedan has awkward, curious proportions from nearly every angle. Its big headlights sweep well into the fenders and flank a chrome-lined grille that adds the appearance of width. It’s not so bad up front, but from the side the Versa’s truncated tail looks dowdy. A longer roofline and unique front and rear styling gives the Versa Note a cleaner, more cohesive look. It’s more like a European van than a subcompact crossover. Base Versas ride on steel wheels with hubcaps. We’d consider upgrading to the optional alloy wheels not just for appearance, but because they won’t rust and they don’t have hubcaps ripe for the taking. Inside, both Versas have a similar look with controls grouped high on the dash. With few luxuries, the Versa has a simple, unadorned feel exacerbated by its sparse center console, comically tall gear lever, and bumper car-like steering wheel. The 2019 Nissan Versa turns every drive into a chore. 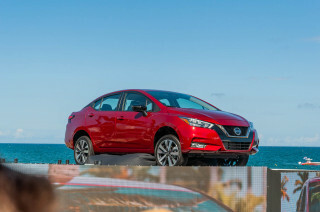 With 109 horsepower tasked with motivating about 2,700 pounds of subcompact car—by the time a driver and a tank of gas are tossed in—the 2019 Nissan Versa is predictably pokey. A transmission prone to surging hardly helps matters. The good news is that the Versa’s ride is well-sorted and has plenty of wheel travel for rough urban pavement or pockmarked dirt roads. 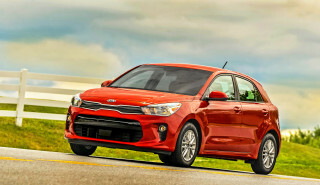 Its steering has good heft and decent road feel for a subcompact car, making it reasonably confident on a curvy road. The Versa’s soft suspension means it leans considerably when pushed, though. Its narrow low-rolling resistance tires howl in protest and give up quickly, too. Nissan sells Versas with a 5-speed manual, but the transmission is relegated to the base Versa S sedan. The vast majority lining dealer lots instead have a continuously variable transmission that’s not especially well-behaved. The 1.6-liter inline-4’s low power output means that the Versa spends a lot of time revving—loudly—to get its job done. Even at idle, the inline-4 thrums into the cabin and vibrates through the seats. On the open road, that drone is tiresome, but not nearly as much as the Versa’s weak crosswind stability. At highway speeds with even moderate wind, the Versa can be a chore to keep between the painted lines. The 2019 Nissan Versa’s interior is more spacious than its small size suggests, but thin plastic trim dominates the decor. Base 2019 Versa sedans and hatchbacks have 4-way front seats that aren’t height adjustable and lack a center armrest. Six-way adjustment is relegated to higher trims and even then only the driver has a center armrest. At least the Versa has decent rear-seat legroom. 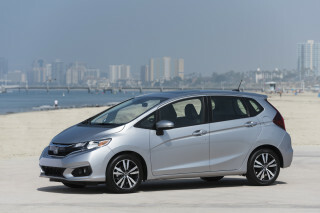 The sedan has about 37 inches, while the Versa Note bumps that up to 38.3 inches. The Versa sedan’s trunk is spacious for a subcompact at about 15 cubic feet, while the Versa Note grows that figure to 18.8 cubes with the rear seat upright and 38.3 with it folded. In terms of space per dollar, the Versa Note delivers. No Versa has an especially dressy interior. Hard plastic surfaces dominate its dashboard and doors. The carpet has a distinctly budget feel and even the cloth upholstery on all trims doesn’t impress. The 2019 Nissan Versa hasn’t been fully crash-tested, but it lacks advanced safety tech. Both versions of the 2019 Versa come standard with six airbags, stability control, and a rearview camera. Active safety tech such as blind-spot monitors, adaptive cruise control, and automatic emergency braking aren’t available. That’s a shame since some rivals now make that gear standard. The IIHS said that the Versa earned “Good” ratings in its basic crash tests, but a “Poor” rating in the driver-side small overlap test that simulates impact with an oncoming car on a two-lane road.The Feds only rated the Versa sedan for side-impact protection, where it earned four stars. Neither Versa has been tested in frontal impacts and the Versa Note hatchback hasn’t been evaluated at all. The 2019 Nissan Versa defines basic motoring. The 2019 Nissan Versa hardly lavishes attention on any trim, but at least it doesn’t cost much. The base Versa S sedan costs about $13,000 and includes a three-year warranty, new-car smell (it goes away eventually), a 7.0-inch touchscreen for infotainment, a rearview camera, Bluetooth and air conditioning. The only way to get the continuously variable transmission (CVT) in the sedan is to spend about $15,500 on the Versa S Plus, which also adds cruise control and a rear spoiler to improve its fuel economy. The Versa SV costs about $1,500 more and adds more adjustment to the driver’s seat, power windows and locks, remote entry, and a few other features. A package with keyless ignition and revised infotainment software with Apple CarPlay and Android Auto compatibility costs $800. Versa Note hatchbacks are generally equipped about the same. 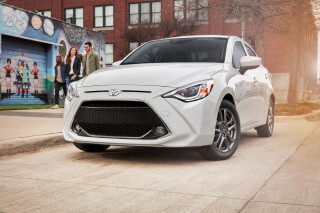 There’s no manual transmission base model, so pricing with the CVT starts at about $16,500. In our eyes, the best bet here is the Versa Note SV with the Special Edition package that adds Apple and Android compatibility, alloy wheels, keyless ignition, power windows and locks, and a few other items for about $18,300. The 2019 Nissan Versa is reasonably thrifty, but its engine works hard at highway speeds. The 2019 Nissan Versa doesn’t deliver the stellar fuel economy you might expect to find from a subcompact car for one reason: its little engine works hard at highway speeds. 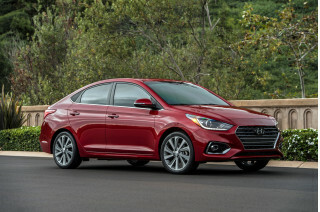 Most 2019 Versa sedans and Versa Note hatchbacks use a continuously variable transmission (CVT) that is rated by the EPA at 31 mpg city, 39 highway, 34 combined. Sticking with the 5-speed manual on the base Versa sedan drops those figures to an unimpressive 27/36/30 mpg. Some compact cars earn better highway and combined figures. If being green is your goal, a used car might be the better choice.